Our Orlando furniture design professionals will come to your home to get a feel for your style and help turn your dreams into reality. Together, you'll plan the room layout, select furniture and accessories and combine colors and fabrics for your favorite look. Whether you need a whole room or just a few peices, this program can help. The service is priceless, and it's free. So come in and meet with a design consultant today, or schedule a visit right now. It's as easy as clicking the following link. There are many factors that go into designing and structuring the furniture in your home. With our knowledge and expert assistance, we can transform your space into a comfortable place to make memories with your friends and family. Call today for the best furniture and design assistance in Orlando! The colors that our Designer decided to use for the dining room are warm and inviting; combined with furniture that is both beautiful and comfortable, the family can enjoy dining in true Orlando style. 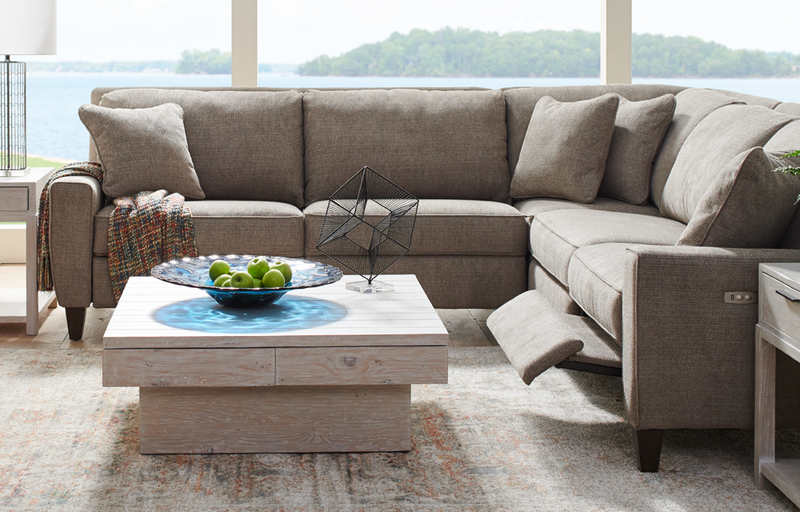 Our Designer created a living room that is "showroom ready" but also comfortable and durable for everyday use. 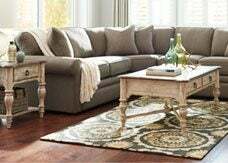 The furniture selected is covered with family friendly fabrics and leather in bold colors that are all tied together in the area rug and artwork. 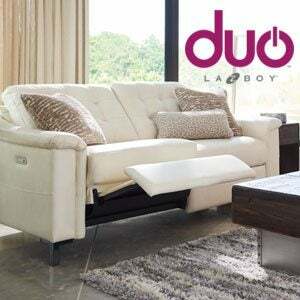 Visit any of the Orlando La-Z-Boy Furniture Galleries stores and meet with one of our Designers to help you turn your house into a home. 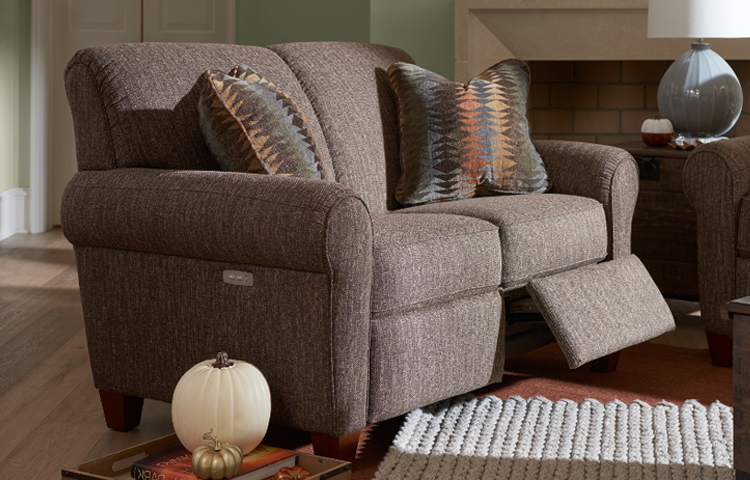 Placing furniture at an angle creates interest and can make a room feel more open and inviting. Notice that all of the furniture is faced inward in order to create a space that welcomes conversation. The area rug acts as an anchor for the furniture and the window treatments soften the corner where the sofa is placed. When your room is quite large or has an awkward layout, consider breaking up the space with multiple seating areas. This can easily be accomplished with proper furniture placement. Here you will notice our Designer was able to create two seating areas in one open living room. 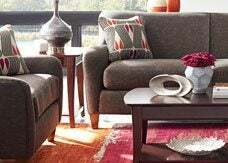 A sofa and loveseat are placed facing each other, while another group of furniture is placed facing the fireplace. The furniture in this room was selected to give the home owner a look that could be found in a model home. 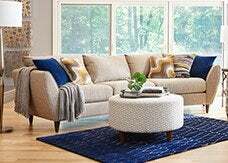 The fabrics are soft and warm in color and give the living room a cozy feel, but also has clean lines making a giving the space a contemporary look. 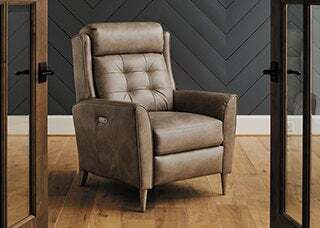 Visit any of the Orlando are La-Z-Boy Furniture Galleries stores to meet with one of our Designers to help you transform any room in your home. 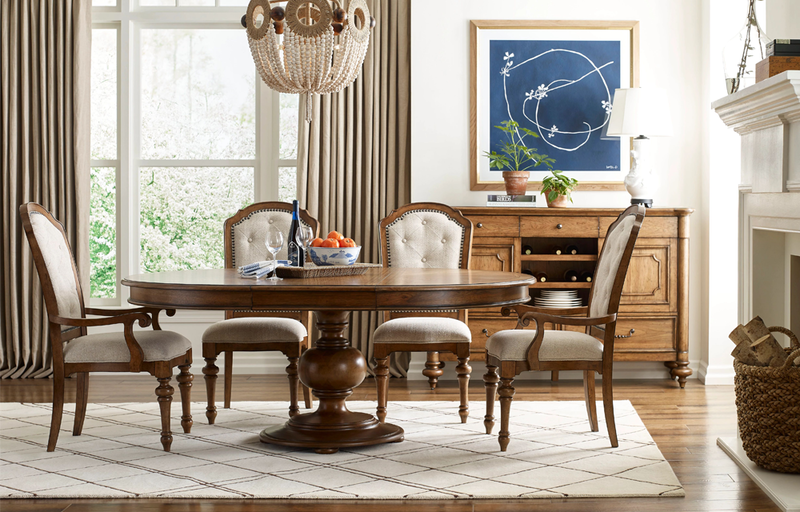 Did you know that La-Z-Boy Furniture Galleries Stores of Orlando can also furnish your dining room? Quality materials are used with a contemporary and comfortable dining room table and chairs that are perfect for everyday use or for those special occassions. Mirrors, artwork, lighting fixtures, rugs and more are also available at La-Z-Boy Furniture Galleries stores. This living room was transformed with a new modern sofa and two recliners. The fabrics selected compliment the stone fireplace already in the room. Table and floor lamps with iron bases add much needed lighting and a large rustic painting creates a room that is both warm and inviting. Our Designer was able to take a blank slate and give this room life and luxury. The sofa and loveseat are covered with a leather that is as soft as butter in a color that is deep, warm and rich. He selected a soft gold for the walls and an accent wall in a bold red that makes a statement. 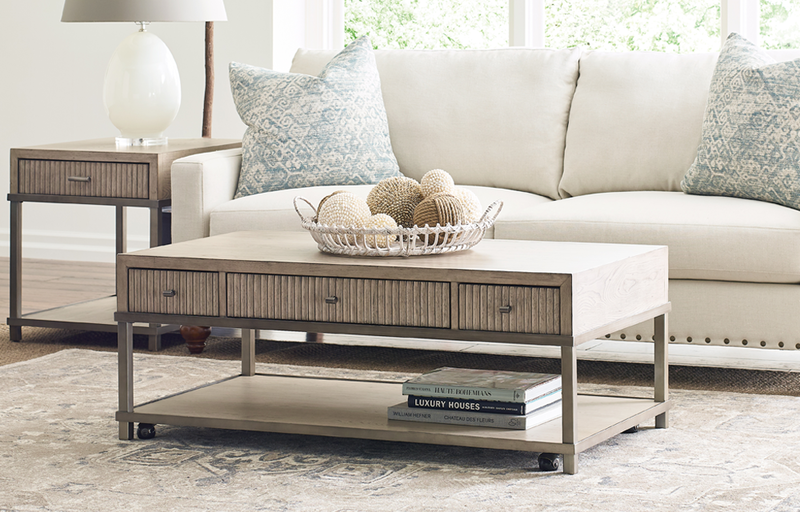 A leather covered cocktail table provides a cozy place to rest your feet, but also a firm space that can be decorated with beautiful accessories. 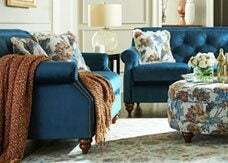 The furniture selected is comfortable and beautiful and become the anchor for the artwork and window treatments. 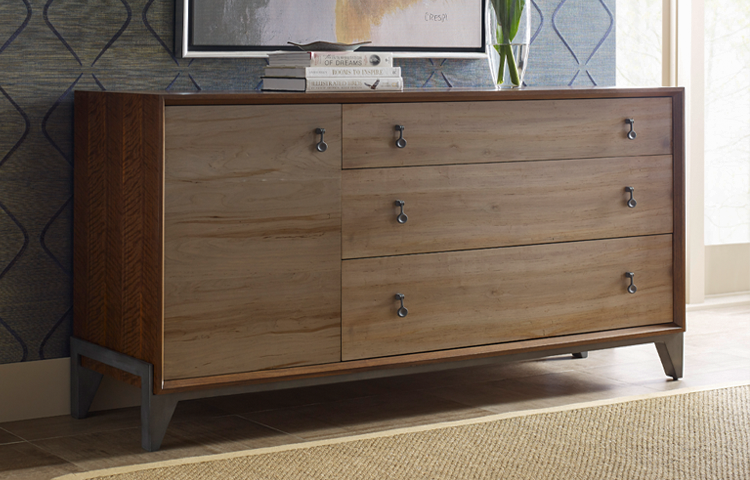 The Orlando La-Z-Boy Furniture Galleries stores offer full design services at no charge! Our Designer selected three fabrics for the sofa in this room in order to add multiple textures and create a true custom look for this family. He selected a bold accent wall color in order to have the furniture stand out. The area rug is more muted in color and creates a soft anchor for the furniture. The style, colors and movement in the pictures and lamps decorate the room without becoming a distraction keeping the furniture in the spotlight. A complete room makeover which includes new wall color, window treatments, furniture, and accessories to function for their family. 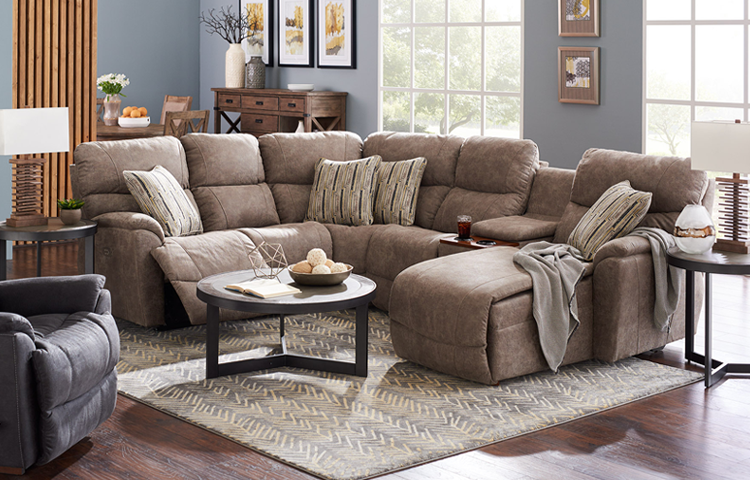 Leather was selected for this sectional because of its beauty and durability. 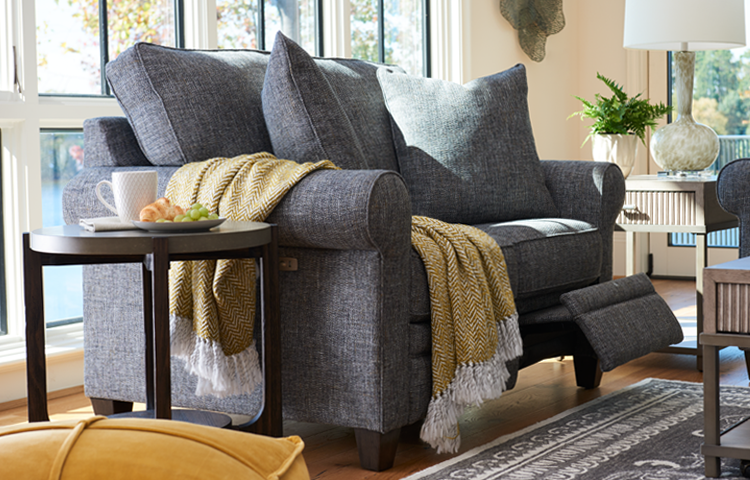 Adding pillows softens the look and also provides an additional layer of color and texture to the space. 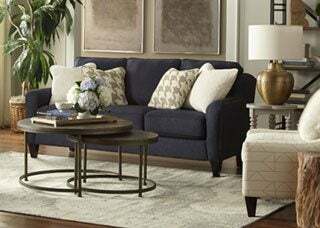 The Dicksons can now spend time as a family in their transitional style room. Free design services are available at all Orlando La-Z-Boy Furniture Galleries stores. A splash of color added spice to this room along with new window treatments and furniture. The use of two chairs and a sofa opens up the room, but also allows for different room arrangement. This clean line room tends towards a more contemporary style that not only has personality but versatility. 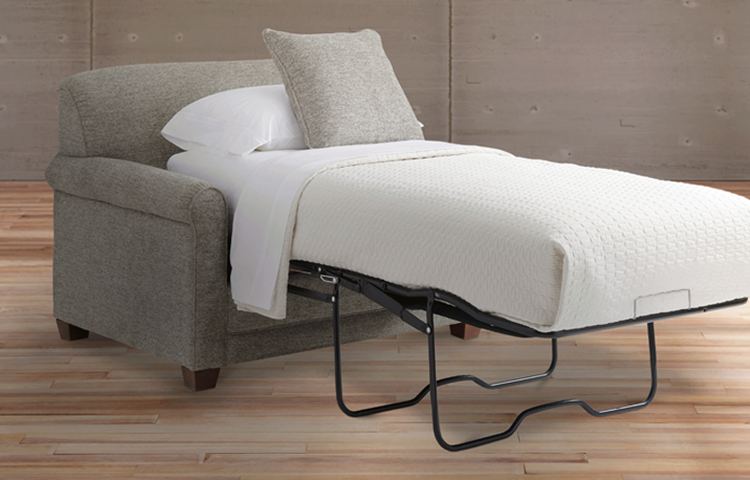 Let the Orlando La-Z-Boy Furniture Galleries Designers transform your house into a home. This room was designed with the home owner's passion for items found under the microscope. With his "bacteria" rug and "amoeba" recliner as accents we brought the color around the room with some fresh drapery and complimentary paint. 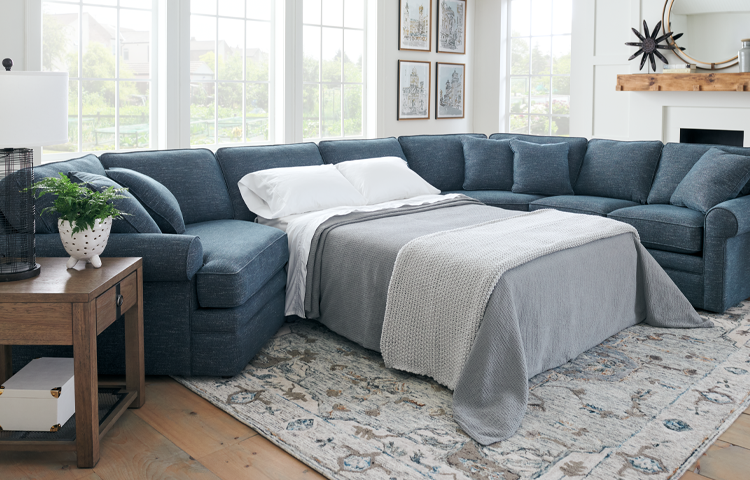 The warm new color of the sectional allowed for the room to feel more inviting while offering the most functional use for the space. 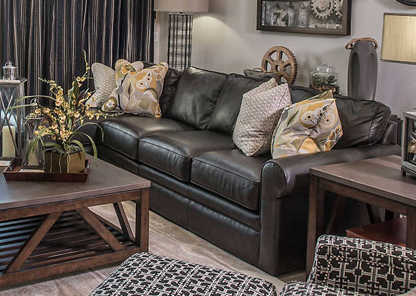 With the design services provided by the La-Z-Boy Furniture Galleries stores in Orlando and the endless choices of furniture options, each room of your home can be transformed and customized to fit your lifestyle and what you're passionate about. 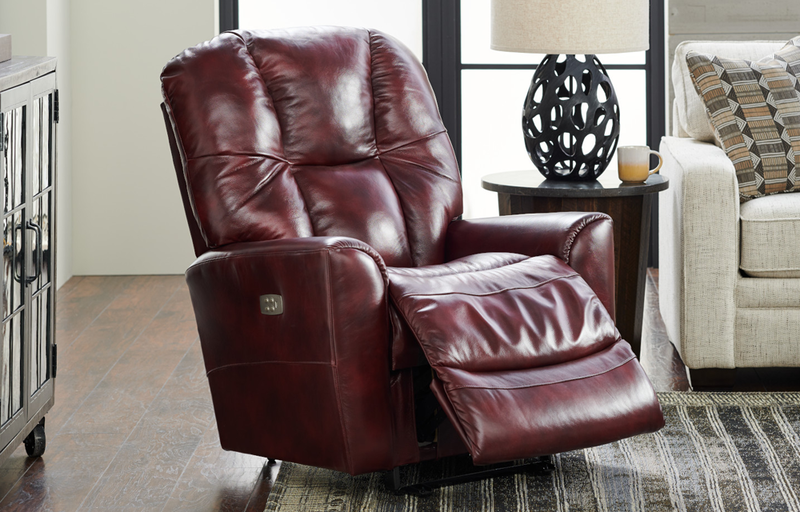 La-Z-Boy is a household name when people think of recliners. Did you know that La-Z-Boy offers a full line of furniture that is available at all of the La-Z-Boy Furniture Galleries stores in Orlando? Here you see a leather sectional that is fit for a large family or a family that likes to entertain, a recliner that is covered in a fabric that none of their neighbors will have (yes, that is a recliner! 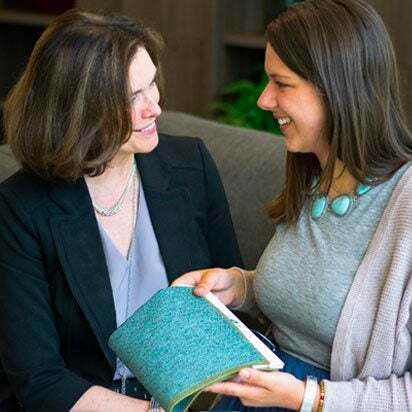 ), an area rug that pulls all of the colors, fabrics and patterns together and even a "faux" fireplace that can put off a low amount of heat in the cool months. 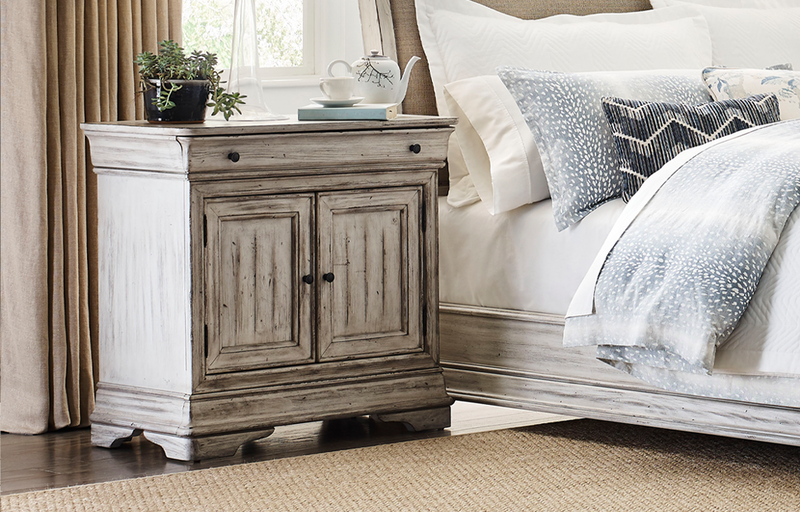 The La-Z-Boy Furniture Galleries stores of Orlando offer complimentary design services for every room in your home! Reclining furniture covered in leather was a perfect choice for this family's living room. 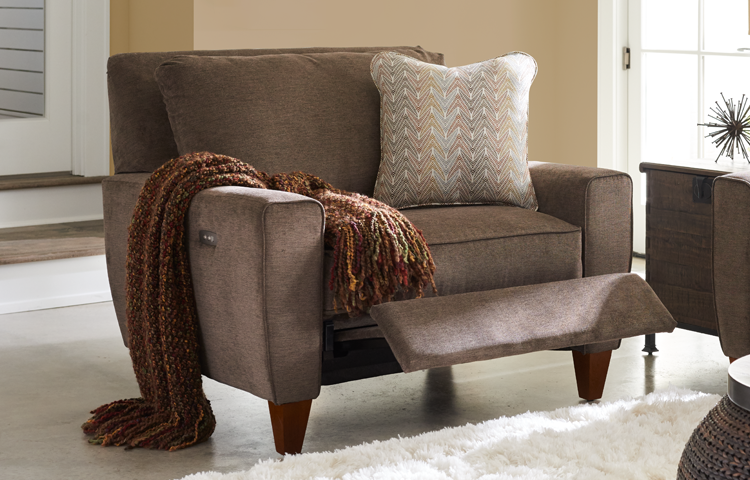 The wall color chosen is warm and inviting and the plush seating is soft and comfortable enough to nap in for hours. The accessories and artwork feature the family's love of Harley's and horses, which makes the space very personal. 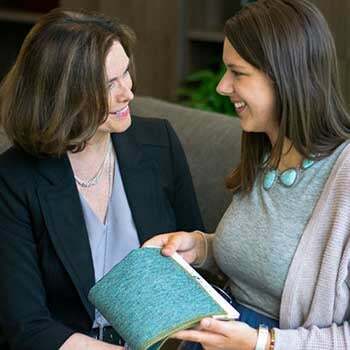 Visit the La-Z-Boy Furniture Galleries store in Orlando to meet with one of our Designers and schedule your private in-home consultation today! Our Designer started with a blank slate and created a room that features a stationary sofa in a rustic, natural leather and added a traditional element with the brass nail-heads on the arm. 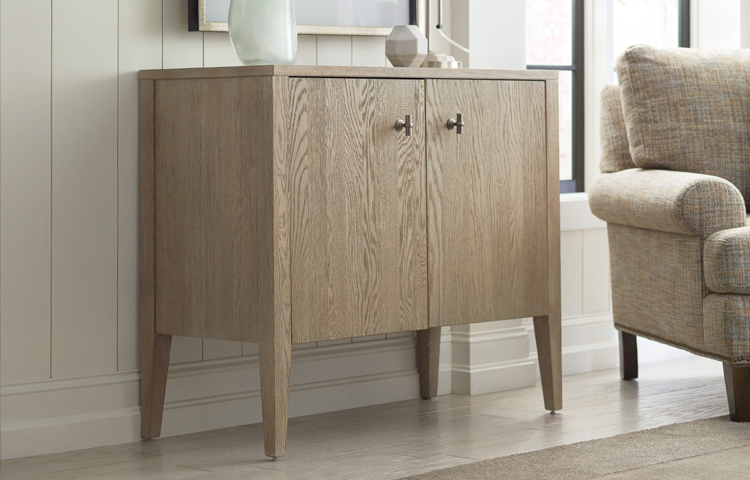 The cocktail table has drawers for storage but also serves as an ottoman to rest your feet after a long day's work. Did you know that La-Z-Boy makes stationary furniture? 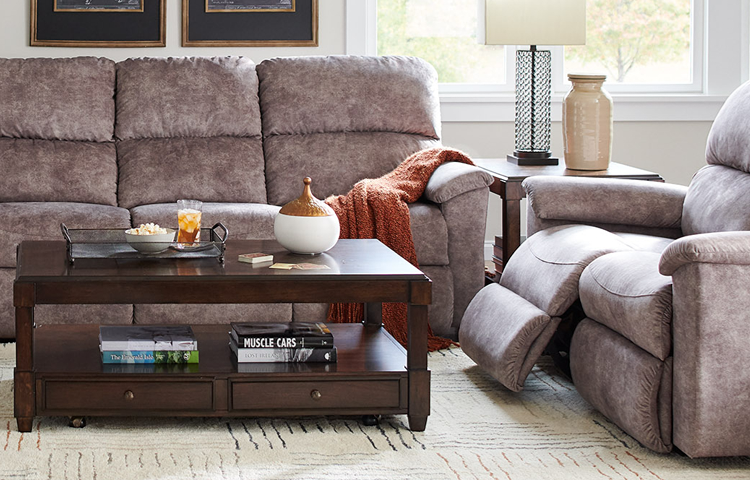 The In-Home Designers at La-Z-Boy Furniture Galleries stores of Orlando have the ability to create beautiful spaces for every room in your home. We have access to order accessories, tables, rugs, artwork and even window treatments from hundreds of vendors. This elegant look was created using silver and gray as the featured colors. 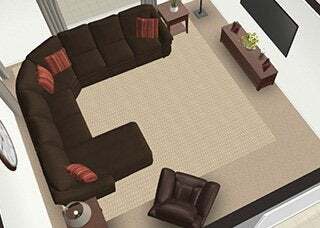 The area rug pulls the room together as the design beautifully reflects the curved legs of the tables and the colors are also in the window treatments and sectional. The plaid pattern on the window treatments give them a casual look while the luxurious feel and sheen of the fabric provide the right amount of elegance to balance this living room. A desk and chair were selected for their beauty as well as functionality. 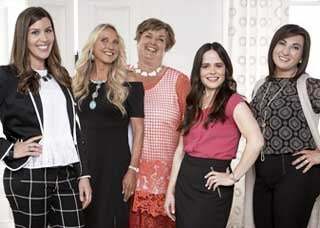 La-Z-Boy Furniture Galleries' In-Home Design Program is complimentary to all of our guests. Let our design team put their expertise to work in your home. By adding a soft, neutral color to the walls the room feels much bigger and allowed for a rich, deep brown fabric for the window treatments selected by our Designer. 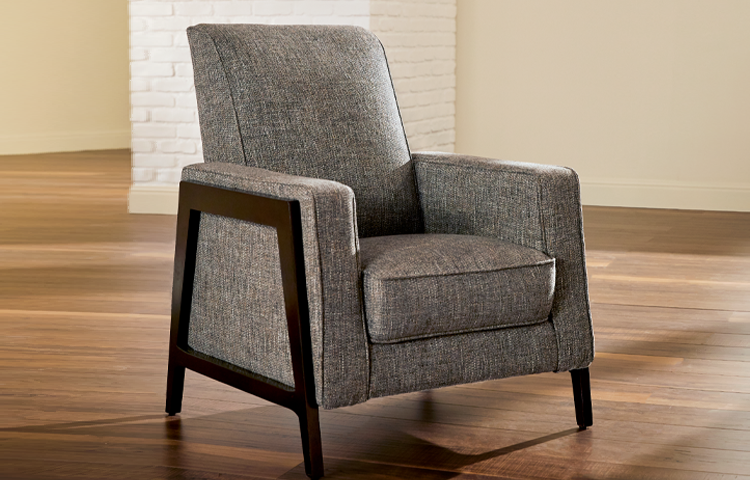 This has created drama and elegance as a base for beautiful and comfortable seating. A soft ocean blue was selected as an accent color and appears in the artwork, pillows, rugs, lamps and the accent chair. Selecting neutral colors for the walls and furniture allows for versatility as styles and preferences change. By starting with a blank canvas and beautiful hardwood floors, our Designer designed a room that is both beautiful and practical. The use of color on the walls and in the window treatments creates contrast to the creamy fabric on the sectional. 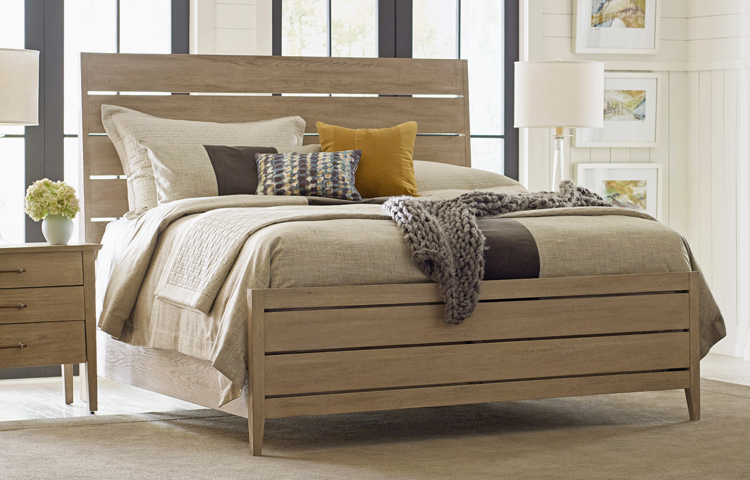 Did you know that La-Z-Boy Furniture Galleries of Orlando could transform your bedroom? That's right, our Designer selected the window treatments, bed linens, furniture, artwork, lamps and rug that created a serene and peaceful master bedroom for this family.